Most nature writing is understandably from the human perspective, how nature affects us, the challenges it presents and what benefits we can obtain from it. The problem with this approach is that we cannot escape the constraints of language, and our stories about literature, religion, poetry, philosophy and drama tend rather to emphasize our separateness from nature, not our place within it. Furthermore, cognitive scientists tell us that our sense of self, through which we mediate our experience, is an illusion and that our mind is riven with cognitive biases that distort our perception of reality. Even our vision is affected: “For all our experience of a rich visual world, it seems that we take in no more than a handful of facts about the world, throw in a few stored images and beliefs, and produce a convincing whole in which it is impossible to tell what was real and what imagined.” In short, we are told that our normal perception of reality is in fact more like the distorted reflections on the wall of Plato’s cave than a true reflection of reality. If correct, then Joseph Conrad’s description of the darkness in every human being is not just fiction but an unfortunate fact of existence. The “horror” is within us. Of course we can never completely escape the human perspective but sometimes, just sometimes, at the right moment, if the student is ready, a new field of vision will open up. In these brief moments, when a chink appears in the matrix of our minds, we are free. Great post. You reminded me of a short story by Paul Bowles entitled ‘Allal’ where an outcast Morrocan boy becomes a snake, at least in his mind, or the author’s, and perhaps the reader’s. Pretty haunting. And, am I a 70’s Swedish-pop musician who dreamed I was an eagle, or an eagle who dreamed I was a 70’s Swedish-pop musician? Chris, thank you for this great comment. I loved the link to Allal which I had never come across. 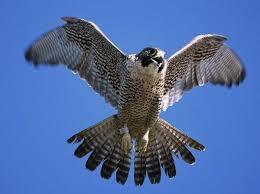 Our atavistic nature is a theme that runs through The Peregrine. I also loved the Abba video! Interesting point of view. I am going to find his book. Thanks! Sally, I’m glad to spread the word. Sometimes chasing shadows dancing on the cave walls is easier than stepping out into the daylight. Freedom is mental and psychological as much as physical. A very thought provoking analysis, Malcolm. This is so true and for that reason I believe most people are not interested in freedom whether it is physical or mental. Thank you Michael, I can see why. All children’s books are books about nature…wish you could come around here and see what I see…wish you could observe the considerable allure of the olive trees…and of course, I wish I could say more…. The beauty of life. Great post Malcolm. Here are the lyrics to this haunting ballad. One of Dylan’s best. Thank you Michael. The lyrics are both haunting and unforgettable and they certainly convey the idea that things just happen to us in life that we neither understand nor control. Great post, Malcolm. I hadn’t really thought about how narrow my view of nature is due to my own cognitive limitations. Becky, thank you. It is so counter-intuitive because we all want to believe that the world is exactly as we perceive it. On the other hand, in the East they have had plenty of time to get used to the idea that this is not the case. Thank you and I did enjoy the account of special trip. Thank you. Too much wisdom on ‘Songs of Compassion’, too little time. Traveling into the mind of an animal, even momentarily, is the best experience I’ve had. I’ve never had that happen with a bird though. Fantastic essay. Lisa, thank you. I would love to hear more about your experience if you are open to sharing it.